A huge increase in long-term storage fees in their fulfillment centers. The minimum wage for US workers doubling to $15/hour. Amazon’s private label brand strategies. H2, Amazon’s second US headquarters. These are all indicators of massive growth, and the world is watching to see what happens. That’s why we reached out to some of our biggest partners to get their insight. 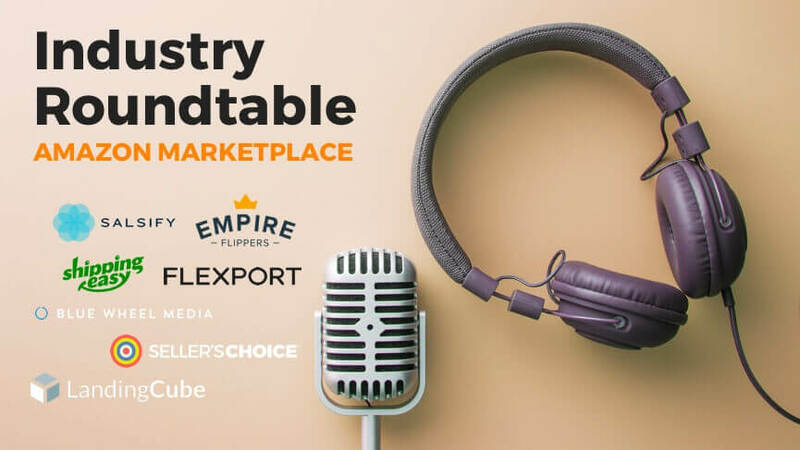 Take a seat at our roundtable discussion to hear their reaction to the latest Amazon news, and join the conversation by leaving your thoughts in the comments! ShippingEasy: ShippingEasy is the easiest cloud-based shipping and inventory management platform, helping e-commerce sellers save time, money, and grow their business. Flexport: Flexport moves freight globally by air, ocean, rail, and truck for the world’s leading brands. We combine powerful software and dedicated experts to give you accountability, peace of mind, and control over your supply chain. Landing Cube: LandingCube is a software tool that helps Amazon FBA sellers grow their business through external traffic. It converts listings into landing pages in minutes to give out promo codes in exchange for emails, so that sellers can boost their sales while also enabling email marketing, retargeting & messenger marketing. Blue Wheel Media: Director of Amazon, Ryan Burgess, has 7 years of experience working in-house and as a consultant for brands who sell on Amazon. He was a seller himself, before joining the Blue Wheel team. As the Director of Amazon at Blue Wheel Media, he helps clients reach their advertising goals using the Advertising Console and DSP platforms. Empire Flippers: Empire Flippers has helped people buy and sell over $50 million dollars worth of online businesses. Our buyers and sellers span the globe and we have fine-tuned our process and team to ensure you have a safe, secure buying and selling experience. Salsify: Salsify is the world’s leading Product Experience Management (PXM) platform. We empower brand manufacturers to accelerate digital growth by delivering the product experiences consumers demand anywhere they choose to shop online. Salsify’s platform combines the power of PIM and DAM capabilities, the industry’s broadest commerce ecosystem, and actionable insights to orchestrate compelling product experiences through every digital touchpoint. Seller’s Choice: Seller’s Choice provides uniquely personalized marketing and managed services for digital marketplace sellers, e-commerce merchants, and brand builders worldwide. Our services are crafted for online businesses that are seeking to enhance their foundation while deploying proven and cutting-edge conversion methodologies. ShippingEasy: The growth of Amazon has impacted almost every business out there. Specifically, in shipping, the introduction of Amazon’s carrier service has been on everyone in the industry’s mind. Amazon has made moves to close down their hold on the customers that use them requiring shipping labels for merchant fulfilled prime orders to be purchased directly through Amazon’s API. However, this has brought about new benefits as e-commerce sellers and even larger e-commerce platforms have stepped up to compete with Amazon’s two-day delivery as well as widening the merchandise available. For the eCommerce sellers, there is also this constant fear of doing anything that goes against Amazon’s wishes as they can be removed from the platform without warning and lose their listing spot. Flexport: Our business is also growing rapidly. In the last 12 months, we’ve opened a new office in Atlanta, Georgia to specifically serve E-Commerce sellers. We are not competing with Amazon. Instead, we are a modern freight forwarder assisting with selling on Amazon and Amazon seller growth. Our model is focused on ensuring Amazon sellers get their goods to Amazon as efficiently, as fast and as cost-effectively as possible, with Flexport handling the shipment and customs process end to end. Landing Cube: Amazon recently introduced Amazon Store Insights. Amazon Stores allows sellers to build out their own brand within Amazon’s marketplace. And Store Insights allows you to tag traffic sources. So when customers go through your Store, you can track where traffic and sales are coming from. On first glance, we were a bit troubled by this development as perhaps competing with our tool. We worked hard to develop a (limited) analytics dashboard for external traffic but still aren’t able to attribute sales in Amazon. On second thought, however, Amazon Store Insights validates the growing importance of brand building, without threatening our main value proposition. LandingCube helps you leverage external sources of traffic (Facebook, Google Ads, etc) to boost sales and grow your brand. Our tool can still be used to make distributing promo codes easier, collect emails and enable retargeting. And now you can actually see if external traffic is leading to sales! Blue Wheel Media: As Amazon grows, the need for sophisticated technology and advanced support for Amazon sellers is also growing. We’ve seen this demand range from small, private label sellers, all the way to fortune 100 companies. Blue Wheel Media has experienced significant growth as an agency in this time as well – becoming an Amazon Advertising Agency partner and receiving access to new tools like DSP that can help us do more for our clients. Empire Flippers: The growth of the FBA space has been massive. We’re seeing these businesses are reaching a point of maturity now that investors have become keen on acquiring FBA businesses. I can’t point to any new features or processes, but there is an old myth I would love to clear up with FBA sellers. Amazon talks about how you’re not allowed to sell your FBA account to another person. This statement can be pretty misleading for FBA sellers. Many have no idea that it is actually not against Amazon’s ToS to sell their FBA brand on a marketplace like what we have on Empire Flippers. We work with Amazon every single week on migrating FBA businesses over to new owners, so if you’re afraid you’re building an asset you can’t eventually sell… don’t worry… you definitely can. What Amazon is really saying about selling accounts is that they want to make sure nothing fraudulent is happening. That is why if you decide to sell your FBA business, whether you go private or with a broker, you should get written email confirmation from Amazon so that they’re aware of what is happening. In fact, if you tell Amazon you’ve sold your business (usually as an asset sale), they can give you the best practices on how to transfer the business over. Salsify: We’re in the business of helping brand manufacturers adapt to the changes brought on by digital commerce, so a high percentage of our customers are very focused on Amazon. It’s the 800-pound gorilla they need to pay attention to. About a year ago we launched our free Amazon Product Content Grader which shows brands how to get systematic about optimizing their product content on Amazon PDPs to improve sales rank and conversions. Our platform is designed to make it easier for the brands to publish and update product content quickly. And since Amazon is continually changing the way its merchandising works – whether it’s new content requirements to meet or new features to take advantage of – the most successful brands able to continually monitor their performance and then act quickly to course correct and beat the competition. We’re hearing a lot of positive feedback about features like our Salsify Command Center for Amazon that help brands get actionable insights to improve performance amid the constant change. Seller’s Choice: Amazon’s exponential growth has brought a plethora of new opportunities for sellers looking to launch their product online. However, this growth has also made it so easy to become a seller that the competition can be more of a threat than an opportunity. It’s so easy to source products and undercut other sellers that we now strongly suggest anyone selling on Amazon to OWN YOUR BRAND. Sellers must protect their profits by protecting their IP; without proper branding and intellectual property protection, it’s all too easy for another seller to undercut you by price and take your Buy Box. ShippingEasy: Any new addition to the marketplace will always have the chance to effect change in how the current marketplace functions. While Amazon has over 100 private label brands, our eCommerce sellers span a wide variety of merchandise types. It is likely that many of these sellers will not be effected on Amazon. We also support 44 other eCommerce marketplaces including an open API which will not be affected by these brands. Flexport: It’s difficult to predict how Amazon’s private labels will impact sellers, but we do know that change is inevitable. Flexport’s focus is on providing technology, infrastructure, and expertise to customers as they navigate these changes in the market. Landing Cube: The expansion of Amazon’s private label brands poses an existential risk to each and every FBA seller! Just kidding. You can mitigate the risk of selling on Amazon by building your moat. That is, make your business more defensible against threats from Amazon, other competitors, suppliers and an uncertain economic landscape. Sellers will put in more efforts towards building their brand on and off Amazon. Because the stronger your brand is, the less you are threatened by Amazon’s private label brands. Investing money into building Amazon Stores, a nice looking website, email lists and social followings all contribute to a strong brand image. Also having a diversified, yet coherent, product catalog and making sales across multiple channels contribute to a robust (and sellable) business. Blue Wheel Media: Amazon’s Private Label brands are a point of contention for some sellers – especially smaller businesses that have spent lots of time and energy – and money – into growing their organic rank and presence on the platform. Empire Flippers: This is a scary thing for a lot of FBA sellers, and people looking at buying FBA businesses. However, I don’t think it is as big of a concern as people might believe it is. Traditionally, other big-box retailers often have their own line of products in addition to 3rd party merchants selling goods in their stores. I do think sellers should be wary though. The best strategy, in my opinion, would be to focus on selling products that are not commodities. Commodities (like a USB cable) are going to be easy for Amazon to replicate and are an obvious target for their brands. Plus, since they know commodities have a huge market and people tend to not care what they get the commodity, it just makes sense for Amazon to get into that kind of business with their economies of scale. As you get into more unique products, the chances of Amazon launching their own will diminish. But… this is a big reason why you shouldn’t just invest in new products if you want to scale a huge FBA business. You should be investing in growing a real brand that has an emotional connection with your customers. Salsify: Amazon private label brands are absolutely having an impact on the brands (1P sellers) that we work with. Being digital first, Amazon private labels can test out the best practices in selling online without having to work around legacy systems and processes or ward off counterfeit 3P sellers. This rapid digital growth and flexibility can have a tremendous effect on the market share of more established brands who are juggling online and offline presence across multiple channels. Our recommendation to the brands we work with is to try to transfer all the brand loyalty and trust that they’ve built over the years on to their Amazon PDP. They can mean using enhanced below-the-fold content and direct product reviewers to their Amazon page. Seller’s Choice: Amazon has clearly started to favor their own private label brands. We believe that, in the near future, Amazon will continue to grow and acquire brands and eventually have the power to own a majority of their categories. We urge Amazon sellers to think about ways to protect their livelihood by not relying solely on Amazon. Jungle Scout: What should new sellers be thinking about going into their first holiday season? Book shipments with your freight forwarder 2-3 weeks before it’s ready to be picked up at your supplier. This will allow your freight forwarder to reserve space ahead of time, which is especially important in this tight market. Look at your quote’s expiration date. This is the date your cargo needs to be gated in at the airport or seaport (not when it’s ready to be picked up at your supplier). If your shipment is not gated in at the airport or seaport by the expiration date, you can expect to receive a new quote with potentially a new rate. Expect Amazon’s LTL trucking service to take anywhere from 2-3 weeks delivery time, starting from the date it’s picked up from your freight forwarder’s warehouse. If your shipment is time sensitive, consider paying extra for SPD (FedEx or UPS) which has a delivery time of 1 business day to the local area and is available for up to 200 cartons. Have your supplier apply the FNSKU, carton and SPD labels (if applicable) to your cartons in order to expedite warehouse processing times. Landing Cube: Think long-term and be prepared for the unexpected. It’s ok to have several “loss-leaders” for holiday sales. That is, you can give sell product at a loss with the goal of making more money over the lifetime interactions you have with customers. Again, this is particularly a viable strategy if you are able to collect contact information and you have built a strong brand on Amazon and across the web. And make sure to have more than enough inventory in stock. Many sellers do a great job of pushing a large amount of product through promotions and benefit from increased rankings. But then they run out of stock. And their suppliers don’t get back to them. And fast forward 3 months and still no stock. So now they are basically back to square one. Blue Wheel Media: Amazon gets really competitive during the holidays. It’s important to come into the busiest season of the year well prepared and with a robust advertising strategy in place. Lots of consumers are looking for deals during this time of year, so new sellers should consider how they can layer in promotions and discounts to their advertising strategy. Remember to submit new ads and promotions early, as Amazon has strict deadlines and cut-offs for deal and ad submissions. Empire Flippers: Inventory. Logistics can make or break you, especially in the high demand season of Q4. If this is your first holiday season, you hopefully have already prepped for big sales coming down the pipeline. You should keep track how many orders you get meticulously – something you should do for every quarter. You can review these numbers and compare them to the rest of the year and eventually use this data to help you gauge how much more inventory you’ll need to order in the coming year based off growth goals you have. For sellers, especially new FBA sellers, inventory management can be an incredibly challenging situation. You want to make sure you stay up to date with everything when it comes to supply chain management. Salsify: Even if you are new to Amazon, a lot of the challenges are the same. Most decisions on Amazon are largely made by an algorithm. You must continuously test and learn how to get every product page to rank higher and convert more often. Avoid being out of stock. Leverage the right keywords. And use product images and enhanced content that speak to the value of the product. We release an annual Holiday Shopping Keyword Intelligence Report which can help you decide which keywords to target. Seller’s Choice: New sellers should be thinking about ways to keep their customers so that they can continue to sell to them after the New Year. Having a solid holiday season is great, but what about the rest of the year? Make sure your customers are building loyalty to your brand so, next time they purchase, they will trust you enough to leave Amazon to purchase directly from your online store (in turn boosting your margin). ShippingEasy: Customers are always facing new challenges in the eCommerce world. These days, customers are working to set up their marketing strategies and organize their inventories so they can support growth. ShippingEasy can help with that! “Once you approve a shipment plan, you are required to ship your products to Amazon as stated in that plan, including sending the stated quantity of each product in that plan to the assigned Amazon facility. You’re not permitted to delete some of the shipments in a multi-destination shipment plan (aka multiple Amazon fulfillment after you approve that plan. You’re not permitted to delete some of the shipments in a multi-destination shipment plan after you approve that plan. If you delete portions of a shipment plan, or if we don’t receive all of the shipments in your approved multi-destination shipment plan within 30 days after the first shipment in that plan arrives at our facilities, we will notify you by email that your shipments aren’t compliant with this policy. Therefore, you must adhere to your Amazon shipment plan in its entirety and send all inventory into the specific Amazon Fulfillment centers you’re given. Landing Cube: New challenges are always popping up in the physical product selling business. Successful sellers are able to take these challenges in stride, adapt and learn. Recently, the 2018 review apocalypse has caused much stress and set some sellers back. Amazon is seemingly deleting reviews for no apparent reason (maybe a glitch in the bots). The solution has been more of the unsexy, groundwork, plus a hot new tool. Building a strong brand and developing relationships with customers (something Amazon makes difficult to do, admittedly) increases the odds of getting reviews…selling great products that make an impact, and offering top-notch customer service. Additionally, many sellers have been experimenting with Messenger chatbot funnels to collect reviews, which is seeing promising preliminary results. Blue Wheel Media: The biggest challenge that every Amazon Seller is encountering now is increased competition. Amazon has become a pay-to-play marketplace, where you need to spend money to make money. Brands who try to tackle the intricacies of Amazon Advertising are learning just how hard it is to be at the top. Especially in congested categories. Empire Flippers: Since we help people sell their Amazon FBA businesses, I can talk about two challenges that I see come up quite often. The first and most common is the lack of a good Profit & Loss (P&L) statement. Your P&L statement should be accurate, detailed and up to date every month. It is the most crucial document in your business. If you decide to sell your business, or even if you don’t, I highly recommend you get your P&L documentation looked over by a bookkeeper or at least loaded up into a software like Quickbooks. Even if your P&L only has a SMALL error on it, that error can be enough to shake the confidence of anyone looking to acquire your brand. After all, if your most crucial document has an error… what else might be wrong? The second issue is keeping too much inventory on hand when they go to sell their brand. If you have an FBA business worth $500k, and you have $400k in inventory, you will need to do heavy negotiations to interest buyers. You should keep a good amount of inventory on hand, but it should be a healthy percentage, not the ENTIRE percentage of what your business is worth. When you have too much inventory on hand, this sends red flags to a buyer about potential dead inventory along with a host of other possible problems. A good rule of thumb: you shouldn’t have more than 20-25% of your business’s total valuation in product inventory. If you have no idea what your business is worth, we created a free valuation tool that can give you an automatic valuation. It’s a ballpark range, but it’s a good place to start if inventory is a major concern of yours. It’s also useful if you’re looking to possibly exit the business down the road. Salsify: Now that Amazon’s A+ Content options are more robust than ever, we often get questions around which SKUs to prioritize and how to ramp up content quickly. We recently launched new enhanced content capabilities that allow brands to take full advantage of Amazon’s new A+ Content below-the-fold options at scale. In general, our recommendation is to provide as much content as possible. Then, monitor results to adjust your page and keep pace with competitors in your category. Seller’s Choice: The increase in competition is causing an increase in advertising costs. Sellers have to spend more on PPC campaigns to get the clicks that they used to. Also, well-branded sellers are doing better those who aim to simply transact. Amazon also limits the amount of real estate a seller can brand themselves on. And it’s imperative that they utilize the space in a way that is eye-catching and spreads your message clearly and concisely. After all, it takes seconds to frustrate a customer to the point that they will never purchase from you again. Join the discussion in the comments below with your own thoughts and reactions!